Chile Pepper Bedding Plants… over 500 varieties from Cross Country Nurseries, shipping April to early June. Fresh pods ship September and early October. Go here. 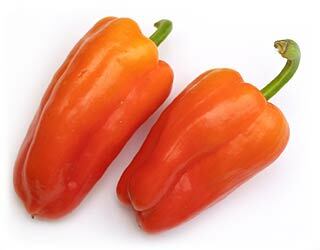 Chile Pepper Seeds… from all over the world from the Chile Pepper Institute. Go here. 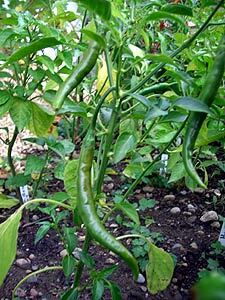 Pepper growers in colder climates in the United States and Canada, and in higher altitudes such as Colorado (a 56-day growing season at 8,500 feet), face many challenges in producing a good crop: a short growing season, low night temperatures, unexpected frosts, and high sunlight intensity. Fortunately, there are solutions for these problems. Start seed indoors eight to ten weeks before the last expected frost date. Plant seed in a sterile, soilless mix, and keep the seed at 75 degrees, under fluorescent light ten to twelve hours a day. Two weeks before transplanting seedlings into the garden, cover the rows with clear plastic mulch to warm the soil. Before planting, harden off the seedlings by leaving them outside for two weeks or more, for increasingly long periods of time each day. Transplant seedlings when daytime temperatures average 70 degrees and nightime temperatures stay above 55 degrees (ideally). Soil pH should be 6.5; use a balanced fertilizer (5-10-5 or 10-10-10), but go easy on the nitrogen or you will have great-looking plants and no fruit. Cutworms can be a problem in northern gardens, so always protect seedlings with cardboard collars. Water during dry spells (at least 2 inches a week), especially after fruit set. Site-Specific Planting. Cold weather gardeners need to pay particular attention to garden planning. Planting the peppers on the south side of ridges that run east and west in the garden will increase the growth rate because the soil facing the sun will be warmer than level soil. Raised beds that slope toward the south can also be used. Sunken beds covered with polyethylene sheeting that has been cut with slits for ventilation will give plants a good start in cold weather. Row Covers. In Connecticut, the problem is that the growing season for bell peppers is too short to achieve good production of mature red and yellow pods. In 1987 and 1988, Martin Gent of the Connecticut Agricultural Experiment Station used floating row covers made from spun-bonded polypropylene. This light and porous material is draped directly over the plants and traps solar energy, warming the plants by 5 degrees F. during the day. Gent transplanted seedlings of numerous bell varieties on April 20 and covered them for eight weeks. He also transplanted plants on May 23 and covered them as well. The later transplants did not result in early production, but the results for the April 20 transplanting were good, with several varieties (Golden Belle, Gypsy, Canape, and Parks Early Thickset) producing early yellow or red pods. Growth under the row covers increased yields (number of peppers) by 12 to 19 percent; however, the average weight of each pod decreased between 5 and 15 percent. Gent concluded that row covers work well for gardeners in short growing seasons who need earlier maturing pods. Polyethylene bed covers worked well at Uvalde, Texas. Researchers from Texas A&M University found that row covers tripled the early yield of New Mexican varieties. Using row covers can bring in a crop between 2 and 3 weeks earlier than normal. Home gardeners can fashion row covers from clear polyethylene stretched over wooden frames, or they can utilize clear, corrugated fiberglass. Row covers are also available to home gardeners from mail order companies and garden shops. The manufacturers of Reemay say that their product insulates plants against light frost and enables the grower to plant 10 to 14 days earlier. They also claim that their spun polyester row cover extends the harvest by two to three weeks and keeps insects out–which would be a perfect way to avoid cross-pollination. Plastic row covers, which are really small row greenhouses called cloches, protect delicate plants from wind, cold, and snow–but not against insects. Warming the Ground and Extending the Season. In addition to mulches and row covers, there are other methods to warm the soil so that peppers can get a head start during a short growing season. Some gardeners grow their peppers inside automobile tires (or inner tubes) that are filled with water. The tire protects small plants from the wind and absorbs heat from the sun. 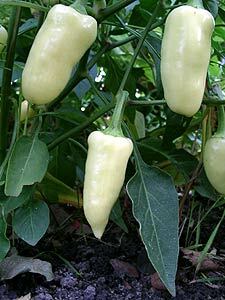 The water warms both the soil and the air around the peppers, releasing heat during cold nights. With the tire, the open water may offer breeding sites for mosquitos, so place a few drops of motor oil on the water. Many nurseries and garden supply shops sell flexible plastic rings that are filled with water, serve the same purpose as the tires, and are more attractive. Another soil-warming technique is to fill one-gallon plastic milk jugs with water and bury them halfway in the ground next to the plants. Solar radiation will heat the water, which will keep the ground warmer near the plants. Reflector panels, made of wood and painted black or aluminum, can be mounted on the north side of ridges that run east and west to reflect sunlight onto both the plants and the ground. Such reflectors should be removed later in the summer when the weather heats up. Microclimates in some regions seriously affect the length of the growing season. For example, in Albuquerque, certain parts of the valley are hit by early frosts but the higher elevations are not (cold air sinks, remember). What often happens is that after an early frost, the weather will warm up sufficiently for another three weeks of growing. The problem is to keep the early frost from killing the plants. Short of using heaters, like the citrus growers do, the best and easiest solution is to cover the plants. Many materials can be used to cover the plants, such as cotton bed sheets, clear or black plastic sheeting, nylon netting, plastic row covers, and even large cardboard boxes. The choice for the gardener depends on the arrangment of the plants–and, of course, their size. Ideally, the thickest and most dense material will retain ground heat the most efficiently. However, sometimes thick material is heavy enough (especially if there is rain or snow) to break off branches. Each gardener will have to make the decision based on available materials, the amount of work involved in covering the plants, and the projected low temperature. If the temperature is expected to hover somewhere between 28 degrees and 32 degrees, the effort is probably worth it. If the temperature is expected to drop below 28 degrees, the effort will probably be wasted. The commercial copy for a product called Wall O’Water claims that this product adds up to eight weeks to the growing season. “Teepees” of clear plastic eighteen inches high, filled with three gallons of water, surround young plants and protect them from the wind and cold. The water teepees absorb heat and release it during the night. When the plants are mature and frost threatens, the water retains heat and releases it at night. In the case of freezing temperatures, the water actually releases heat as it freezes, further protecting the plants. Recommended Varieties for Colder Climates. We have searched the information sent by various state cooperative extension services in colder states to find the recommended varieties for those areas. Pepper growers in colder regions should contact their extension services for suggestions, then order as many seed catalogs as possible. High Altitude Gardens in Ketchum, Idaho, specializes in seeds and resources for cool weather gardening. The following suggestions are from Alaska, Colorado, Idaho, Minnesota, and Vermont. These varieties are probably the best for cooler climates, but are certainly not the only varieties to try. Bells: ‘Cal Wonder’, ‘Gypsy’, ‘Carlo,’ ‘Mexi-Bell’. 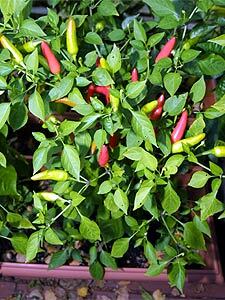 Other annuums: ‘Yellow Wax Hot’, ‘Jalapa Jalapeño’, ‘Long Red Cayenne’, ‘Super Chili’.